Gill Parker is one of the UK's leading artists in Bronze Animal Sculptures. Her work graces the homes and gardens of celebrities, sporting icons and Royal families across the world, and resides in the offices of some of the world's best known corporations. To order a Limited Edition sculpture or Commission a piece, or enquire about price and availability, please email Gill directly on bronze@gillparker.co.uk or telephone +44 (0) 7885 273 309 for an informal chat. A deposit of 50% is required with an order, the balance to be paid on completion and prior to delivery. This is non refundable once the casting is in progress. Bronzes are usually cast to order and there can be a 6-8 week delivery time. Once you have decided on a piece it will be made specifically for you and every effort to will be made to tailor the timing and presentation of the piece to your requirements. Please ask, most things can be facilitated. Shipping within the UK is usually included in the price. Shipping internationally can l be arranged at cost. We are happy to advise on all aspects of the ordering process. Payment can be made by cheque, bank transfer or international transfer. Credit card payment can also be made using Paypal, with no account necessary. If you need help with any of this please contact me. Gill makes sculpture in Limited Editions of nine or seven. Prices for Limited Editions start at £2,500.00 and range to £49,000.00 for the large Blue Marlin, currently the largest Limited Edition piece. Commissions are priced individually and depending on your requirements, can comprise a one off piece or multiple copies. Engravings, bespoke bases and plinths can also be arranged, as required. All prices include VAT @20% for pieces sold within the UK or European Union. VAT is not applicable to International purchasers outside of the United Kingdom and European Union. 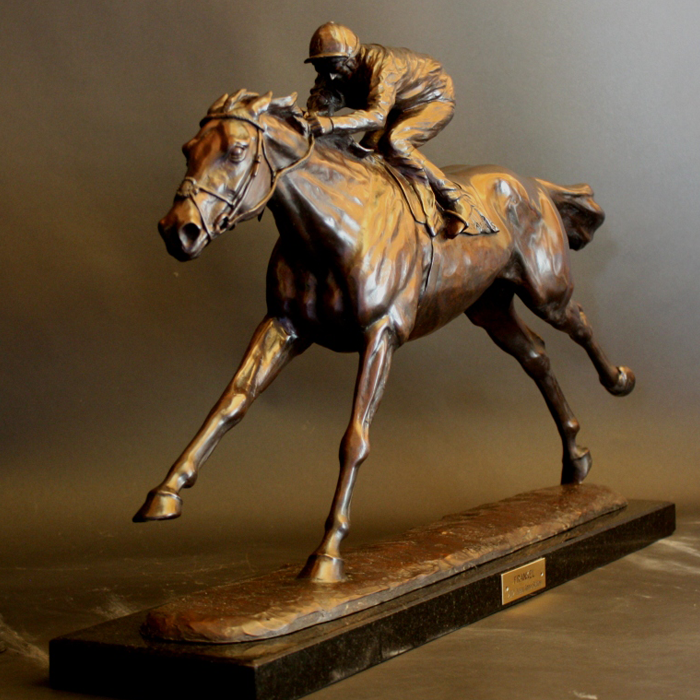 Frankel - Limited Edition bronze by Gill Parker.